I know it’s risky to start homespun advice with similes – sooner or later everything comes out in the voice of Forrest Gump. But here’s the thought. Working life, or “business”, requires you to perform a number of different roles and functions – each of which demands a different style and consciousness from you. In fact these can be very different from each other, and it is unlikely that you can occupy more than one at once… or that you will be effective if you carry one role or persona on into the next activity. It’s also easy for us to waste a lot of time by taking too long to switch – to truly let go of the last thing we were doing. Hence the Triathlon thought. Triathlons can be won and lost in the transitions. So triathletes practice them and consciously plan ways to make them as effective as possible. So maybe we should spend some time identifying and practising the transitions that we make in our working lives – from meeting mode, to writing, to planning, to making calls… not to mention actually being creative or solving problems. It could save a lot of time in the long run, but may also help to make us more aware of these different modes… with wider implications for our work and business. There’s an interesting flaw in the analogy. One thing that can’t happen in a triathlon [I hope] is for someone to be on their bike, but still be swimming with one leg, or on a run but still wearing their streamlined bike helmet. In work, we do this all the time – still carrying the thoughts, emotions or posture from one task whilst performing another… or with half a mind on the next. So something else to practise, with those transitions, is truly letting go of the last thing, focussing on the current one, and keeping the next one quietly in its box. One thing this may force you to do is identify what is needed at the end of a task, performance or role, to allow you to let go of it with confidence. That’s back to the art of transition again. In the words of Curly, from City Slickers, “just one thing”. The photo, by the way, is of William T Burgess. 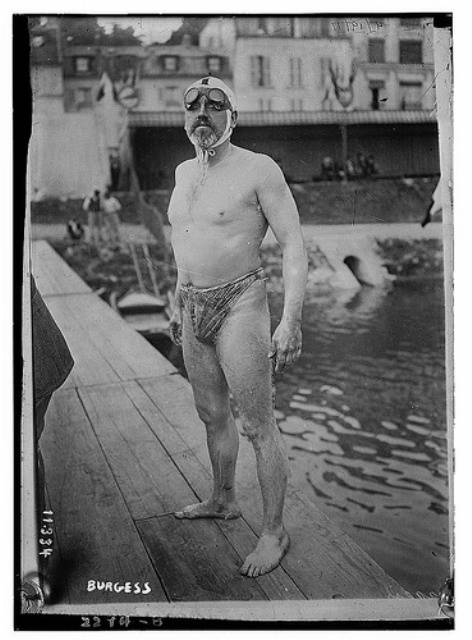 He successfully swam the English Channel in 1911… at his 16th attempt! So there’s a bit of inspiration for persistence thrown in for free.